Winner of the 2012 Bowling Green State University Center for Archival Collections’ Local History Publication Awards, Academic Scholar Division. Professor Floyd's book is an important contribution to our understanding of the need to include those members of our community who live with disabilities. All Americans need to grasp how disabled people can contribute to our society and be a part of a better, more inclusive nation. Joan Uhl Browne, President, Lott Industries Inc.
"History binds us together, creates an identity as a community, and helps us to understand where we fit within society," rightly claim the authors of this work. This book engages readers in the broader disability rights movements that seek an inclusive society based on respect for the broad range of human diversity. It distinguishes itself from many other disability histories by showcasing the importance of geographical place in constructing disability meanings. From Institutions to Independence centers on Ohio, showing primarily since the early 19th century the evolution of institutions, impact of epidemics, and rise of activist campaign and policies. Ultimately, the rich, local stories-- from charitable organizations and deaf clubs in Toledo, and family members as well as schools for the deaf and blind in Columbus, to hospital sports teams in Northwestern Ohio-- paint a history that is fundamentally American. Studies of institutions, employment, community, identity, and family and daily life demonstrate the rich complexity and regular presence of disability in America. 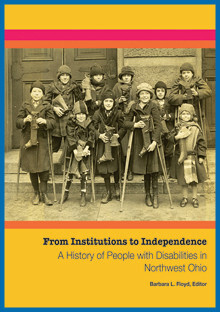 As a material result of a near decade-long campaign to preserve and document disability history in Ohio and across the nation, this book embodies ideas, interpretations, and life stories that students, archivists, teachers, and community members will find accessible and useful. Meaningful lessons abound in this work and its contributors are to be applauded for fusing together activism, rigorous scholarship, and preservation.